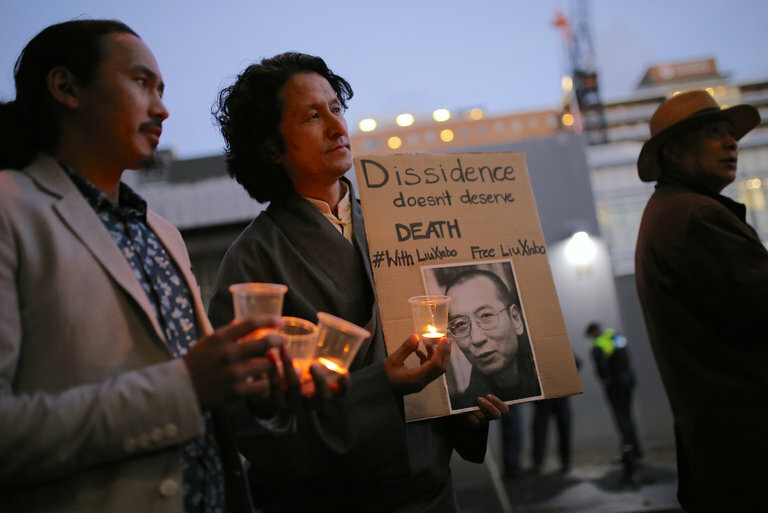 ■ Hong Kong — The health of the Chinese Nobel Peace laureate Liu Xiaobo is worsening, with his liver, kidney and breathing functions failing, the hospital that is treating him said in a statement Wednesday afternoon. Mr. Liu, who was sentenced to 11 years in prison for organizing a pro-democracy manifesto, was told he had late-stage liver cancer in May and moved to a hospital in the northeast Chinese city of Shenyang. Chinese Consulate in Sydney, Australia. The First Hospital of China Medical University said Wednesday that doctors had recommended tracheal intubation but that his family had rejected the request. Mr. Liu’s family could not be independently reached for confirmation of his condition. His wife, Liu Xia, has been under strict house arrest since he was awarded the Nobel Prize in 2010. Photos apparently released by the hospital authorities show her with her husband in the hospital. Mr. Liu, 61, has said he wanted to be treated abroad, but his lawyer said the authorities would not let that happen. Doctors from the United States and Germany visited Mr. Liu on Saturday and said then that he could be moved, but his condition has apparently worsened. He is experiencing septic shock and blood clotting, the hospital said. Mr. Liu was a university lecturer and literary critic in Beijing who became a prominent figure in the 1989 Tiananmen protest movement. He organized a hunger strike in the final days of the protest, and he helped students retreat from Tiananmen Square as the military moved in. He was imprisoned afterward, the first of multiple prison terms. In 2008 he was arrested for spearheading Charter 08, a pro-democracy manifesto that called for an end to authoritarian rule in China. It was signed by hundreds of scholars and activists, a number that has since grown into the thousands. His statement was read at his Nobel Prize ceremony in Oslo the following year, and an empty chair was left on the stage because Chinese authorities would not allow him or family members to travel for the event.